I have received numerous requests for another online class and since time is of the essence (the year is rapidly moving on) have decided to use a similar structure to my live workshops that I teach. In other words I will bring the workshop to you! With this in mind I have designed an Online Guidance Class. 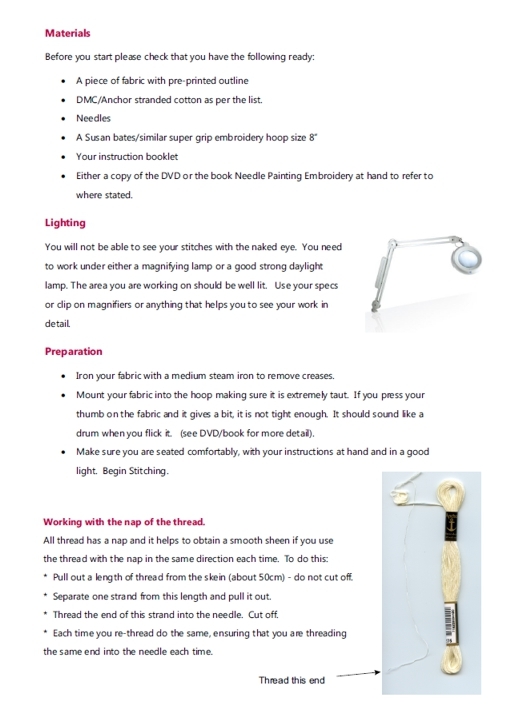 The slide show tutorials that I use in my workshops have been revised and converted into PDF notes that will take you through materials, preparation, hints and stitching – step by step. I will be available by email to guide you through the process and provide instruction, tips and assistance. 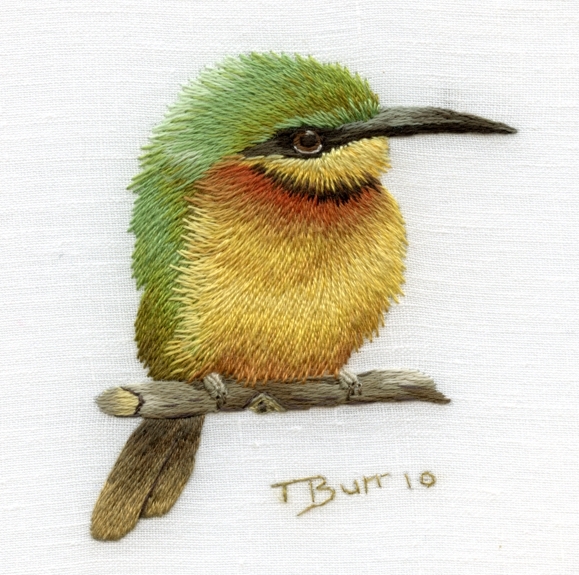 By the time you have completed the class you will have accomplished a better understanding of needle painting embroidery and gained confidence in your ability to stitch more challenging projects. The projects provided are small but sufficient to learn all the techniques. They have been designed to be completed in a 2 day workshop so you will have ample time to complete the design at your own pace in the 8 week period allocated. I always try to design projects that are do-able in the workshop time frame but not so small that the husbands make comments like “You spent 2 days doing that – you’re kidding me, I bet you just gossiped and giggled!” No ‘gossiping & giggling’ just hard work (but lots of fun in between) – it helps to justify your absence and the money spent, if you can take something home that looks substantial? There is a choice of 2 projects available, if you feel you can work on both at the same time that’s up to you! Butterfly & Blossom – beginner project. 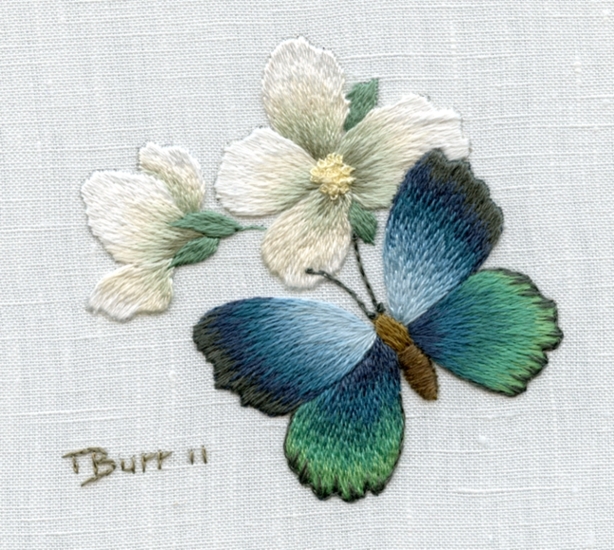 This is the ideal project for a beginner as the long & short stitch shading is repeated on each butterfly wing before moving onto the more detailed aspects of the flower. You will learn how to enhance your shading with the right use of colour and how to add little details to achieve a realistic effect. 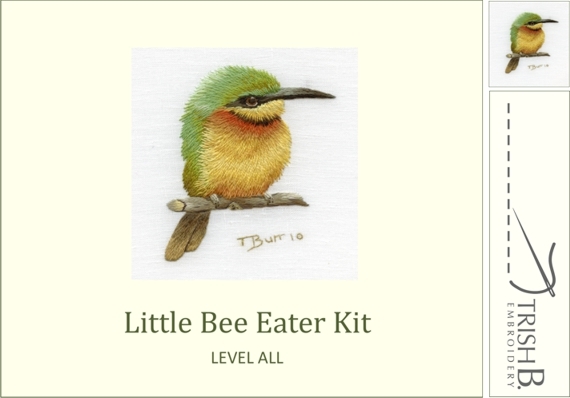 Little Bee Eater – moving on from beginner. It is recommended that you have at least a little experience of the basics of long & short stitch for this project. 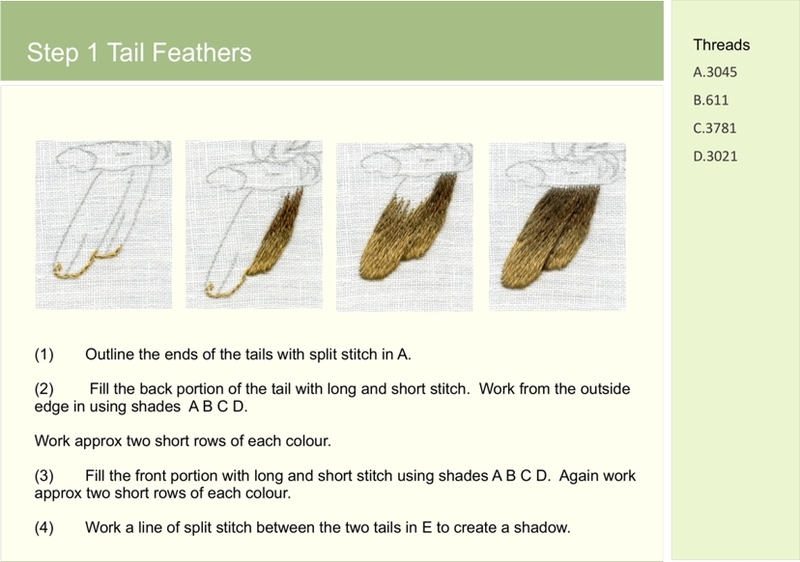 You will learn how to stitch feathers by using irregular long & short stitch, how to enhance your embroidery with the right use of colour and how to add smaller details such as the eye and notches in a branch to achieve a realistic effect. The process is simple, you don’t need any computer skills or blogging experience. Once registered, you will receive a kit by airmail post depending on your country of destination. You will need to supply your own threads and hoop as per the list provided. 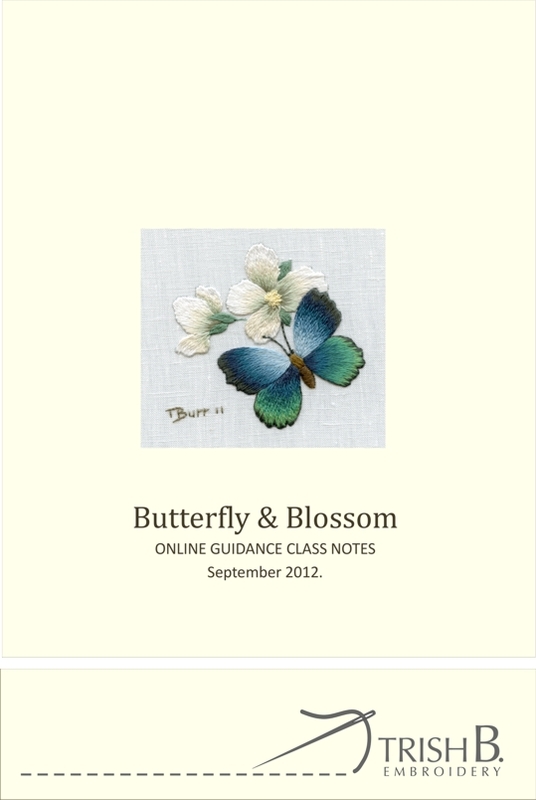 You will be sent the class notes as a PDF file by email- you can either print these out or view from your computer. 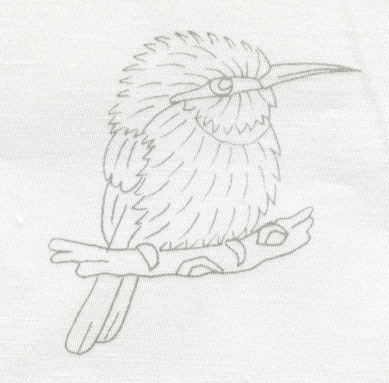 Once everything is received you just follow the notes and stitch – then email me a picture of your work in progress when you are ready or need help. The class starts on September 3rd 2012 and registration closes on 15th August. Places are limited and will be allocated on a ‘first come first served basis.’ For more details on cost and registration see here. South African Residents please email me for eft instructions. Please read through the Terms & Conditions carefully on registration, unfortunately I have had to include a new protective clause as we have had cases of fraud where the individual claims they have not received the materials despite replacements being sent and then a requests a full refund……… You can see where this is going? It really is very sad that one or two people can spoil it for the rest of us honest folks but there it is, I always believe you reap what you sow. Trish, illness will prevent me from keeping up with the online classes. May I purchase DVDs of these classes? Hi Trish, I missed out on email here in Tripoli. (Just deleted 598 emails) If there is perhaps a cancellation , can I book the seat? Please!!!!!!! Just one thing to keep in mind, I can not receive the provided kit, but do have your fabric with me and will do the tracing myself, as long as I can do the class with you. Just cut and paste this into your browser and join! It would be lovely to see you there! How about setting up a yahoo group? I don’t particularly care to be on facebook. Hi Karen, I am sorry but I don’t particularly care for Yahoo. I did Facebook as it is easier for me to manage and most people are on there. However if you want to set one up then please go ahead, however I am conscience that we don’t want too many groups opening, otherwise the members will lose track, so I think we should keep it one location. Can you use Facebook just for the group? Can I ask, will there be somewhere where the students can talk to each other as well? ie. Facebook group, or email swap? Just a thought as we are all so enthused to be doing this course and it would be lovely to talk with the other students, if they want of course! I would be more than happy to start a Facebook group for the students to just chat in, if anyone else is keen. Hope ok Trish, I don’t want to step on any toes! Dear Trish, can you send instructions in French? Thank you, Trish! I have so wanted to take a class from you and now I have the chance! I have wanted to take classes with Trish Burr and now I can. Looking forward to doing these projects. I am so excited to be able to participate in your classes. I have sent off my registration fees this morning! I’m in! Looking forward to it so much!!! At last I can attend one of Trish Burr’s classes – I feel really privileged, I have admired her work for years but living in England I have never had the opportunity to learn from her. I too can’t wait. I am thrilled to have read this today, and have sent off my registration fees, can’t wait! Thank you!